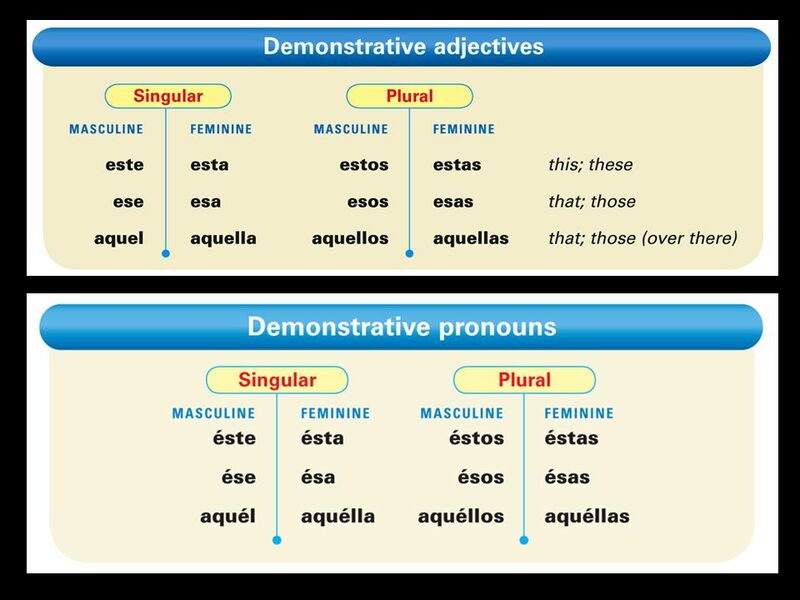 Demonstrative Adjectives. Which flag? – THIS flag. Demonstrative adjectives and pronouns DEMONSTRATE = show/point out. 2 Which flag? – THIS flag. Demonstrative adjectives and pronouns DEMONSTRATE = show/point out. 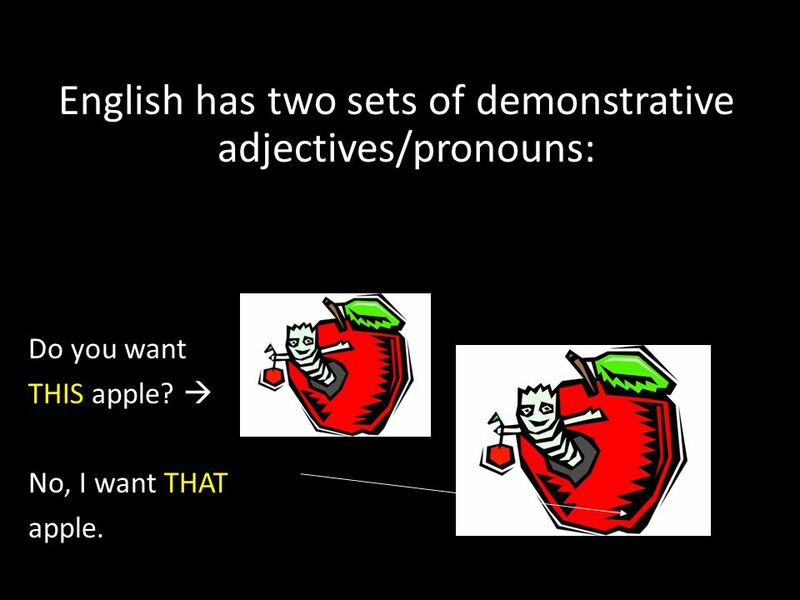 3 English has two sets of demonstrative adjectives/pronouns: Do you want THIS apple?  No, I want THAT apple. 4 But what if there are TWO apples? 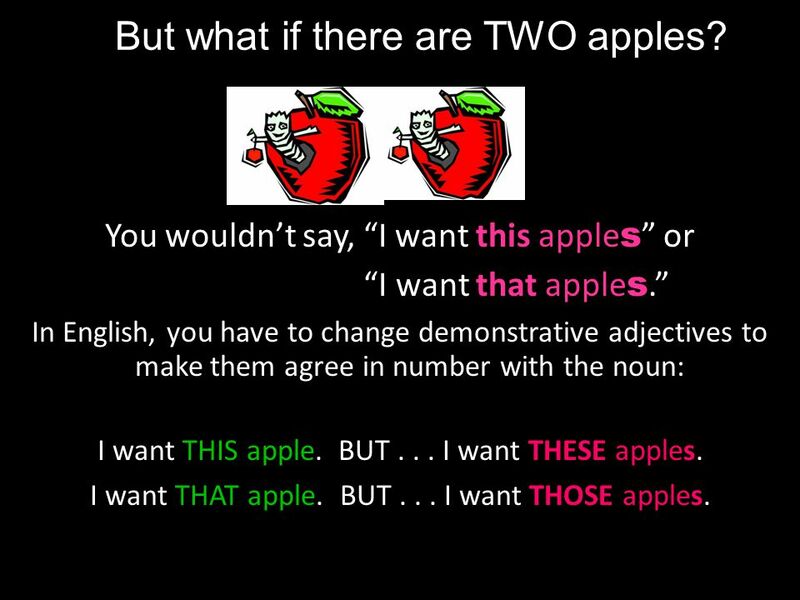 You wouldn’t say, “I want this apple s ” or “I want that apple s.” In English, you have to change demonstrative adjectives to make them agree in number with the noun: I want THIS apple. BUT... I want THESE apples. I want THAT apple. BUT... I want THOSE apples. 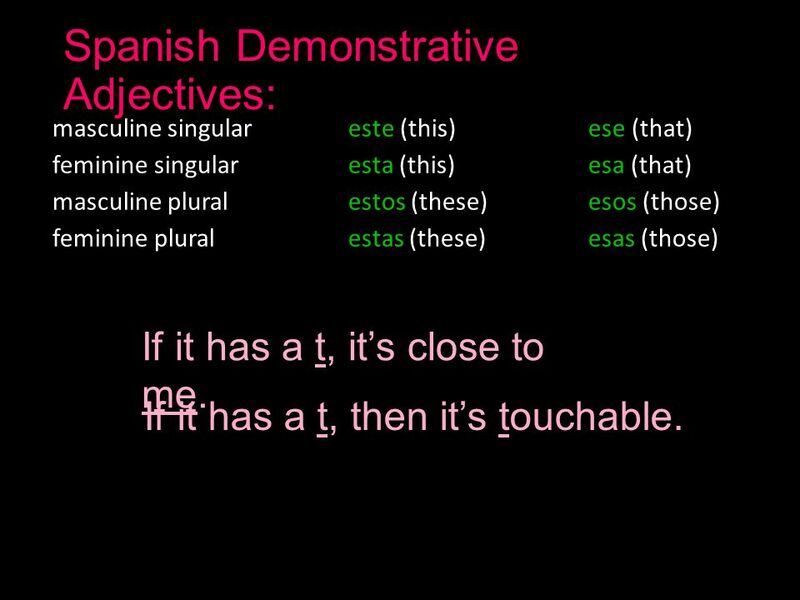 5 Spanish Demonstrative Adjectives: masculine singular este (this)ese (that) feminine singular esta (this)esa (that) masculine plural estos (these)esos (those) feminine plural estas (these)esas (those) If it has a t, it’s close to me. If it has a t, then it’s touchable. 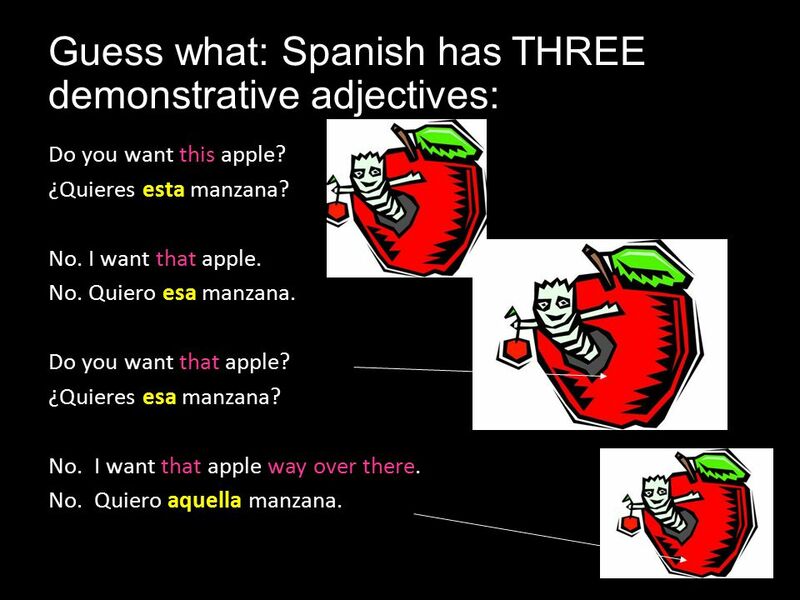 6 Guess what: Spanish has THREE demonstrative adjectives: Do you want this apple? ¿Quieres esta manzana? No. I want that apple. No. Quiero esa manzana. Do you want that apple? ¿Quieres esa manzana? No. I want that apple way over there. No. Quiero aquella manzana. 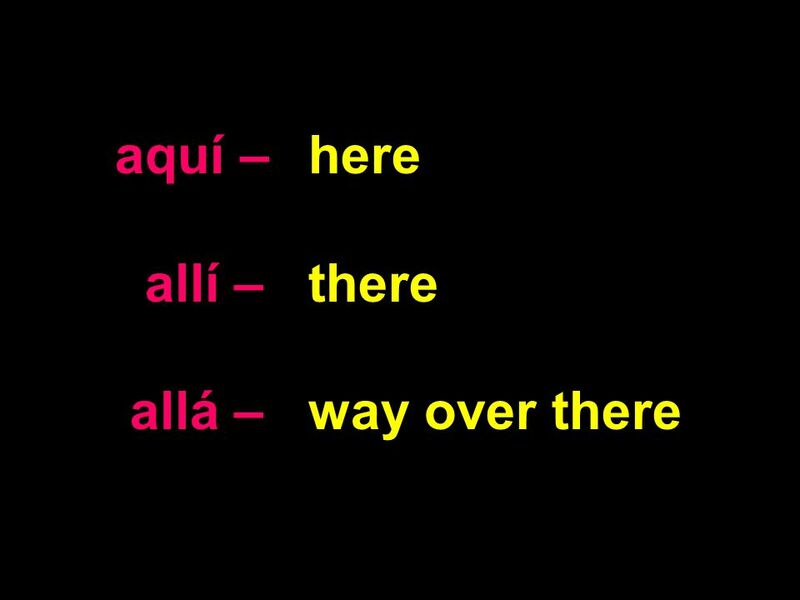 9 allá – over there aquel, aquella, aquellos, and aquellas are used to point out nouns that are far away from the speaker and the listener. 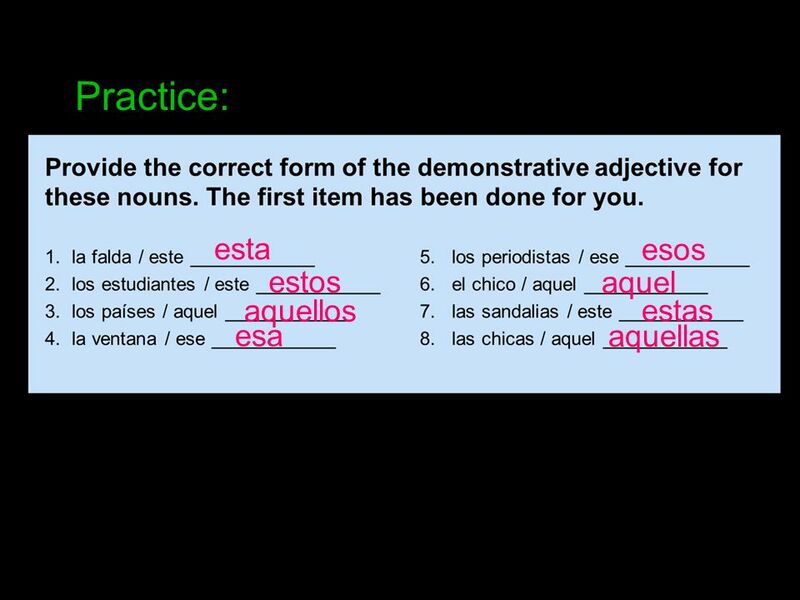 12 What we’ve discussed so far is demonstrative ADJECTIVES. 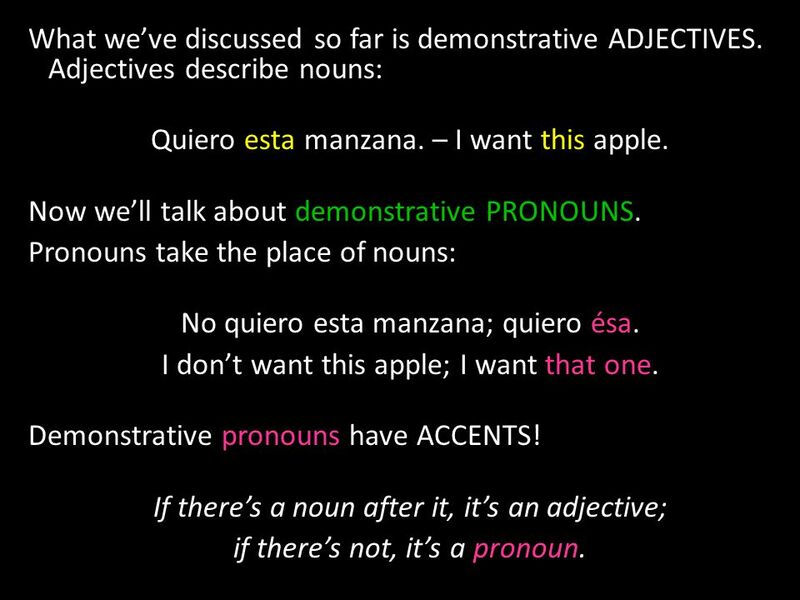 Adjectives describe nouns: Quiero esta manzana. – I want this apple. 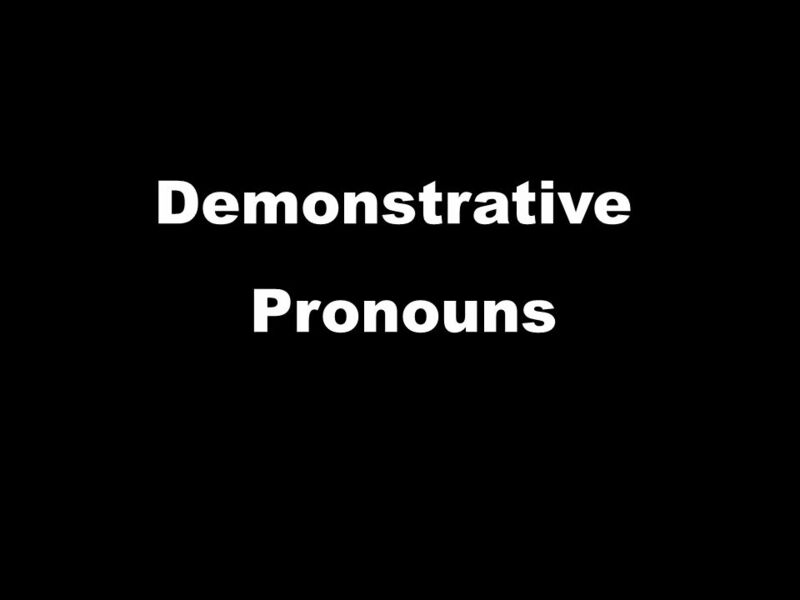 Now we’ll talk about demonstrative PRONOUNS. 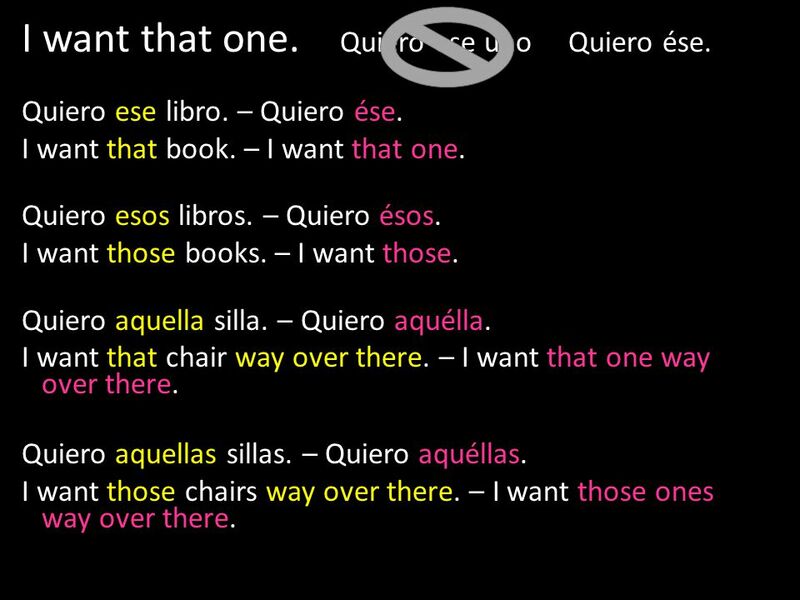 Pronouns take the place of nouns: No quiero esta manzana; quiero ésa. I don’t want this apple; I want that one. 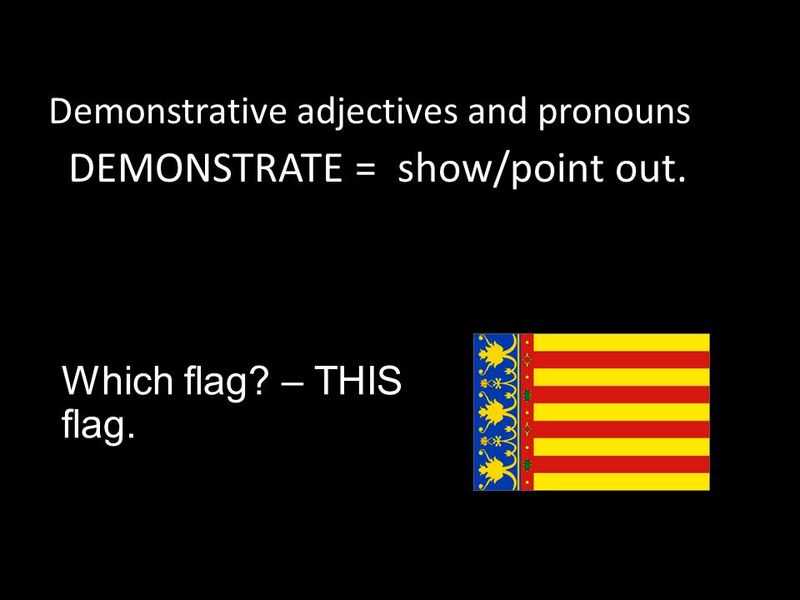 Demonstrative pronouns have ACCENTS! If there’s a noun after it, it’s an adjective; if there’s not, it’s a pronoun. 13 I want that one. Quiero ese uno Quiero ése. Quiero ese libro. – Quiero ése. I want that book. – I want that one. Quiero esos libros. – Quiero ésos. I want those books. – I want those. Quiero aquella silla. – Quiero aquélla. I want that chair way over there. – I want that one way over there. Quiero aquellas sillas. – Quiero aquéllas. I want those chairs way over there. – I want those ones way over there. 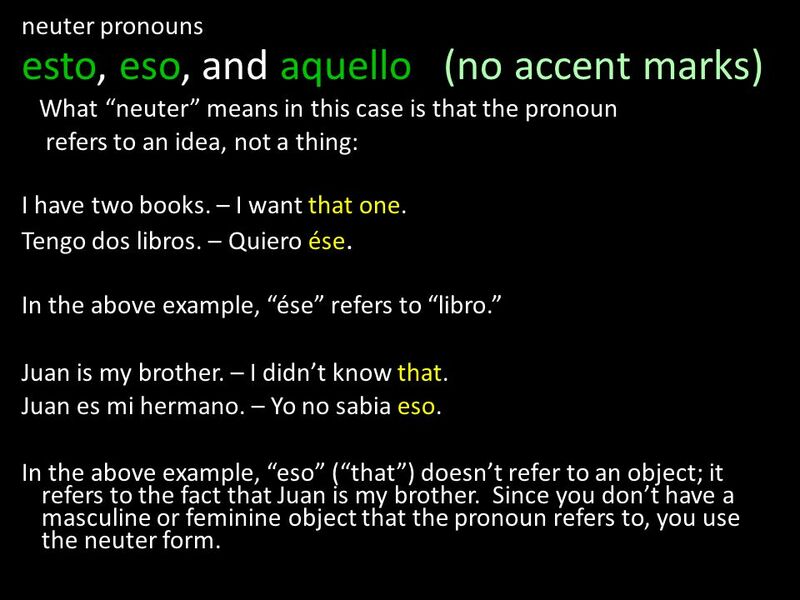 15 neuter pronouns esto, eso, and aquello (no accent marks) What “neuter” means in this case is that the pronoun refers to an idea, not a thing: I have two books. – I want that one. Tengo dos libros. – Quiero ése. 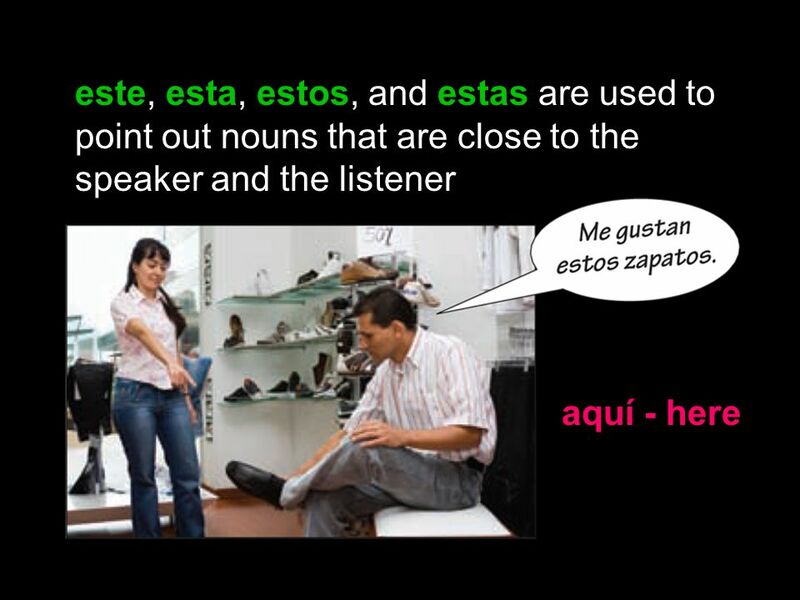 In the above example, “ése” refers to “libro.” Juan is my brother. – I didn’t know that. Juan es mi hermano. – Yo no sabia eso. 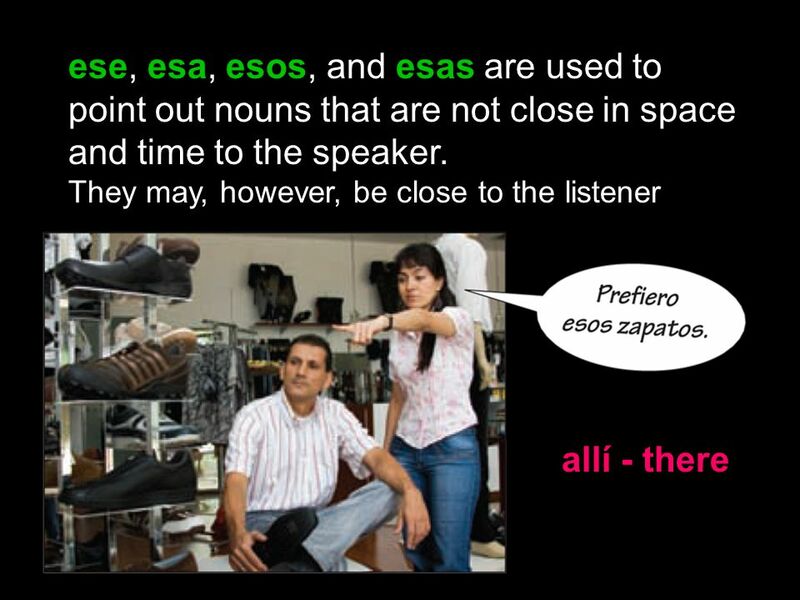 In the above example, “eso” (“that”) doesn’t refer to an object; it refers to the fact that Juan is my brother. Since you don’t have a masculine or feminine object that the pronoun refers to, you use the neuter form. Download ppt "Demonstrative Adjectives. Which flag? – THIS flag. Demonstrative adjectives and pronouns DEMONSTRATE = show/point out." Adjetivos y pronombres demostrativos.. Adjetivos demostrativos. 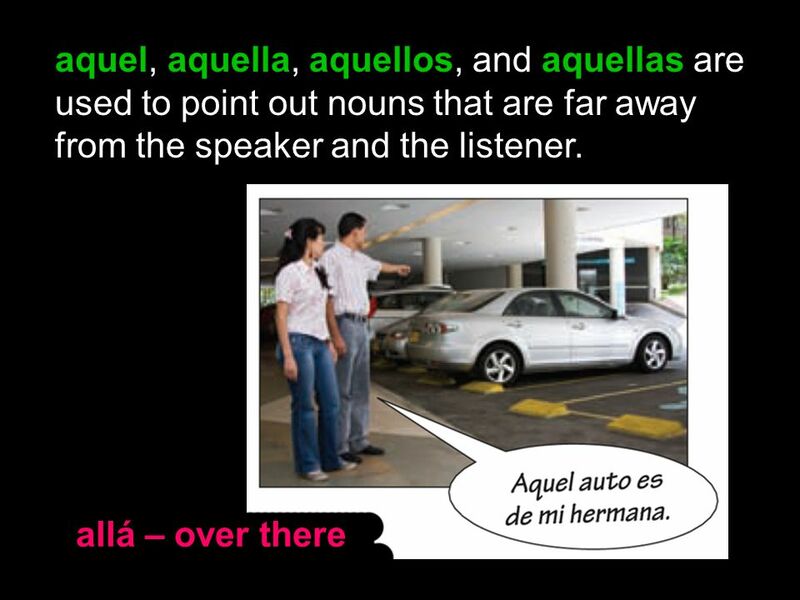 esteestos estaestas this/these eseesos esaesas that/those aquelaquellos aquellaaquellas.